Check out Tobi's Dream Of Me Fuzzy Sweater Don't you just want to touch it? It's a no-brainer: the Dream Of Me White Fuzzy Sweater is sure to give you all the fuzzy feels this winter. This slouchy sweater features an ultra soft fuzzy knit fabric, relaxed sleeves, and the most comfortable fit. Pair this fluffy sweater with wide leg pants or skinny jeans for a chic winter look! Don't you just want to touch it? It's a no-brainer: the Dream Of Me Lavender Fuzzy Sweater is sure to give you all the fuzzy feels this winter. This slouchy sweater features an ultra soft fuzzy knit fabric, relaxed sleeves, and the most comfortable fit. Pair this fluffy sweater with wide leg pants or skinny jeans for a chic winter look! Don't you just want to touch it? It's a no-brainer: the Dream Of Me White Fuzzy Sweater is sure to give you all the fuzzy feels this winter. This slouchy sweater features an ultra soft fuzzy knit fabric, relaxed sleeves, and the most comfortable fit. 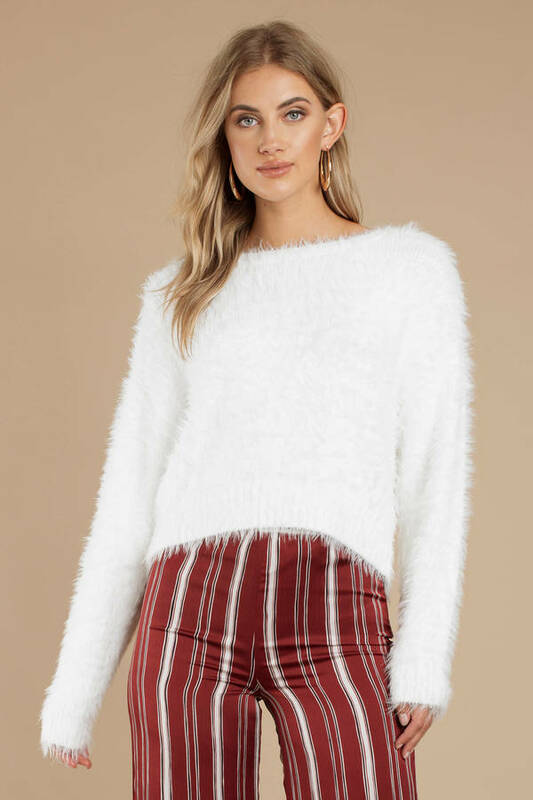 Pair this fluffy sweater with wide leg pants or skinny jeans for a chic winter look!